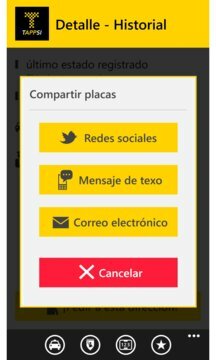 App to request a taxi quickly and safely with just 1 click . - Secure: We validate the criminal record of each driver, and never reveal him your mobile number . - Quick : we have thousands of taxis , so we find the closest to you in seconds. 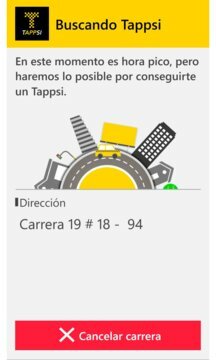 Tappsi is revolutionizing the way of ordering taxis in Colombia , Ecuador and Peru . - COLOMBIA: Bogota, Medellin, Cali, Barranquilla, Cartagena, Bucaramanga, Manizales, Pereira, Armenia. * Confirmations are sent via email or push notifications directly to your phone. * Security: share the cab license plates and/or your route via email, social networks or SMS/iMessage. * Pay your ride with Credit Card from the app. The Tappsi revolution leaves behind the long phone calls with a boring recording, where the machine tells the user "how important is your call", just to say after 5 minutes waiting that there are no cabs available. Also, you don't need a fixed phone line to book cabs automatically. Tappsi also allows the passenger who hails a cab on the street to share the license plates with friends and family.